The built-in test line allows easy testing of the pump without water flowing out of the system. The test line connects to a test orifice mount inside the tank. The Home Hydrant’s Smart Riser control system senses water flow via a pressure drop. It will operate uninterrupted for as long as there is system demand. 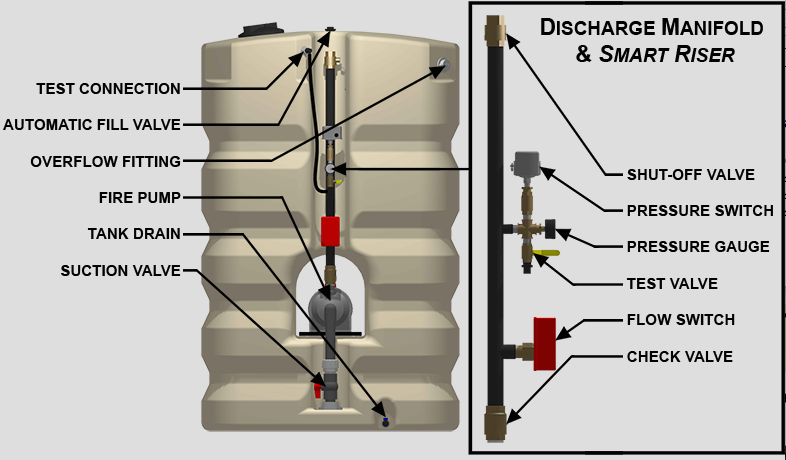 The water storage tank is sized specifically to provide NFPA 13D’s 10-minute water supply requirement for typical residential system demand. All fire pumps available for the Home Hydrant are wired for 240 volt single-phase service. All electrical components are elevated at least 18” above floor level. The water storage tank is semi-transparent to allow one to see the water level without opening the tank. Available in both a 350-gallon tank for the HH3 models, or a 450-gallon tank for the HH4 models, the Talco Fire Systems Home Hydrant was specially designed and built to comply fully with the NFPA 13D 2013 codes. We’re here to serve you, and if you’d like to learn more about the Talco Fire Systems Home Hydrant, or about our industry-leading turnaround times on this and other great fire protection products, give us a call today at 302-652-4722.